Can I Bless This Month For You ? – If Yes Click HERE – Pastor Alph Lukau Wants to Pray For You If You Are Online ??? You are not a Saul, you are a David. Everyone of us has a purpose, everyone of us has a reason to live. There is an assignment that you came on earth for. What you are born for nobody can do. For what you are anointed for, the next door neighbour cannot do. Nobody can duplicate you. Yo are the original. You are the ONE! The Lord has chosen me, I am the one, the choice of the Lord. 5 And he said, “Peaceably; I have come to sacrifice to the Lord. Sanctify[b] yourselves, and come with me to the sacrifice.” Then he consecrated Jesse and his sons, and invited them to the sacrifice. And Samuel said to Jesse, “Send and bring him. For we will not [e]sit down till he comes here.” 12 So he sent and brought him in. Now he was ruddy, with [f]bright eyes, and good-looking. And the Lord said, “Arise, anoint him; for this is the one!” 13 Then Samuel took the horn of oil and anointed him in the midst of his brothers; and the Spirit of the Lord came upon David from that day forward. So Samuel arose and went to Ramah. Amen, l receive it in Jesus Name. Lord l am the one, single me out for your glory. Help me to fulfil my destiny. Fight my unseen battle and give me victory. Amen and amen.I am the chosen 1 of the lord.bless me and anoint Me my God. I’m the one whose sin is exasperated.nay be due to this reason, the enemies have played a great role over my general life. A man of GOD, I always follow you to help me in my anxiety. Please don’t be tired to remember me through your daily prayers. Thank you! Thank You Lord Jesus for Your blessings. 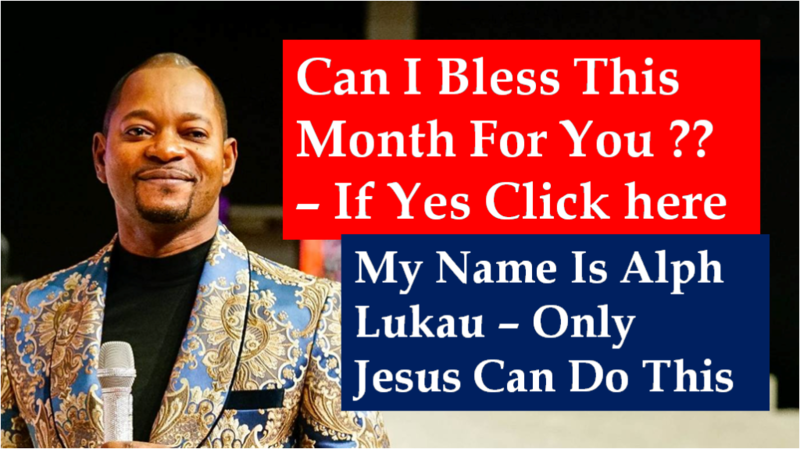 Continually bless Pastor Lukau and AMI in Jesus mighty name. Amen and amen. I am the choice of the Lord. Anointed me Lord with your great anointing to do your will as I am called to do. Hallelujah I praise you Lord in Jesus name. Amen. Amen I believe I am the David of this season. All the goliaths in my life I will slay them by the power of the Holy Ghost. And pray for my life partner. Pray for me to buy a house in CANADA.Pray for my school. Thanks Man of GOD. Man of God, Please pray for my health and Finance. I need a new vehicle and have no money to buy it. God bless! Thank you Jesus , I Love you. Anoint me with your goodness my lord and my God. Yes Papa, please bless me. Yes Papa, bless this month for me. Please Man of God, pray for my blessings to remove me from my financial debts. Thank you Man of God. Bless you Man of God. I asked this in Jesus Name. Amen pastor pray for my future husband Ben Otto is sick that God may heal him and bless him spiritually materially and that God may open doors of opportunities for me to get job. Trust the Good Lord will complete what he started in my life to ensure I reach my destiny in Jesus Christ name amen.